“Sovereign is a place that finds you when you need it most,” says Riley P., age 15. Riley graduated from Sovereign Health’s eating disorders program at our Rancho San Diego adolescent treatment facility. She and her mother Joanna recorded a video describing her Sovereign experience. Riley lives in Texas with her family. She came to Sovereign feeling like she had no redeeming qualities to offer the world. She admits to not thinking she needed help for her eating disorder until it became apparent to all that she did. Today, she has plenty of good things to say about herself and about life. She can sit (relatively) still, saying “I’m not a complete nervous wreck.” She has less anxiety, and she smiles now. She says she owes much of her turnaround to the Rock to Recovery program. Rock to Recovery is the brainchild of Wesley Geer, a former guitarist for the band, Korn. Geer lived the rock and roll lifestyle of excess to excess. When substance abuse took control of his life, he sought treatment. He discovered one of the few things that kept him sane was strumming a guitar. When he started, others wanted in. He describes folks lining up in rehab just to get an opportunity to strum the guitar. From this, Rock to Recovery was born. Geer enlisted the help of this friends in the music industry (most of who are also in recovery) to bring music making to treatment. As of June 2015, Rock to Recovery was laying down over 200 tracks a month at over 30 treatment centers in 60 locations, from San Diego to Malibu to Hawaii. Writing and recording her songs afforded Riley an outlet for her creative musings. She says she has been writing songs for a long time. She already knows a little piano, so she jumped on the keyboards and started singing. On its music page, Rock to Recovery maintains all of its recordings so patients can hear and share them any time they like. Riley’s other favorite treatment activity was art therapy. Art allows her to express herself. Riley enjoyed a close rapport with the instructor. The pair worked together effacing some rather anatomical drawings left behind by male patients. This was not Riley’s or her family’s first rodeo. Her mother Joanna said other treatment facilities failed to take the time to get to know, let alone understand, her daughter. Joanna admits to being terrified when they first arrived at Sovereign. “So far from home,” she says. But like Riley, Joanna was put at ease by the staff and the clinicians. What she most appreciated was the open communication. 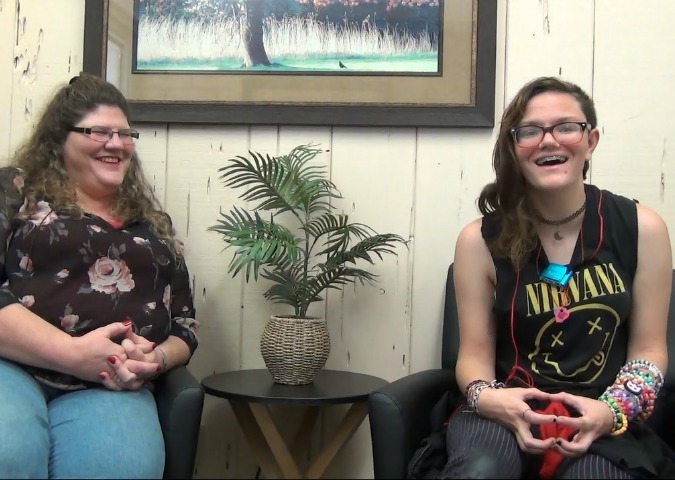 “At other places, you’d go a week without hearing anything.” She says she also appreciated how the staff worked with Riley’s school back home in Texas to ensure she didn’t fall behind academically. When asked what she took away from the experience, Joanna says greater trust and understanding. She has learned to trust her daughter’s decisions. She also has more insight into what Riley goes through. As a result, she communicates more effectively with her daughter.